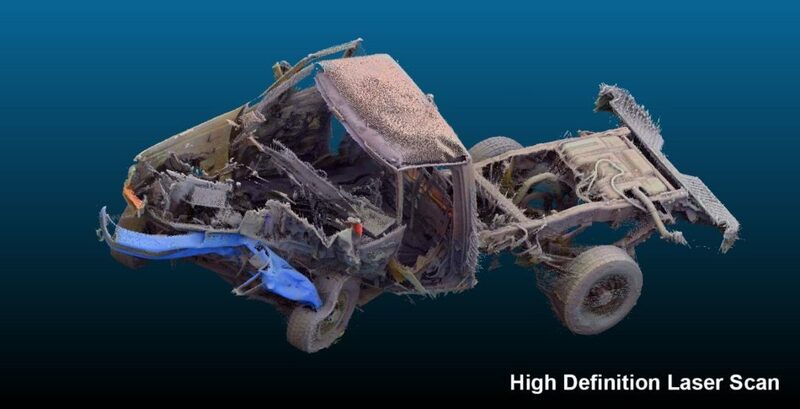 What is 3D Scanning and How Does it Help in Accident Reconstruction? High Definition 3D laser scanning is phenomenal technology. This technology has been in place for about 5 years for commercial application. It is fantastic technology because, in the past, using the typical method of surveying, you would have a “Total Station”, where an individual person has some equipment mounted on a tripod in a construction area. That person is pointing and shooting a laser to capture some points and another person is holding a pole with a reflector. That process is very cumbersome and time consuming. It could take an entire 8 hour day to shoot maybe 800 points. Today’s scanner can automatically shoot about 45 million points in approximately 10 minutes. For example, if you take 4 different scans to document a motor vehicle or document a building, you would have around 200 million points in one hour. Each point has XYZ coordinates so you can go inside virtual space and find out any distance or measurement between two points in that scan out of those millions of points. So it is like a virtual model of the real world in your computer. If you scan this room, you can find out the distance from the tip of your nose to the camera and that can be found with the accuracy of 1/16 of an inch, very accurate. If you want to know how far it is from point A to point B out of millions of available data points, you will have all that information available and documented forever. You might say, why bother with that when you can take a picture? The problem with the picture is there are no dimensions. You can see the object in the picture but to determine how far is it from point A to point B, you have to use some photogrammetry methods which are convoluted and more complicated. Laser scanning is very useful when a car has crush damage that needs to be measured, or when a bridge or building collapses. You just freeze that moment in time and you come back and measure anything you want.